Davenier, Christine, and Graham, Bob, Senator, and Jeram, Anita, and Kleven, Elisa. Very Good. In Every Tiny Grain of Sand: A Child's Book of Prayers and Praise. Sewn binding. Cloth over boards. With dust jacket. 77 p. Contains: Illustrations. Intended for a juvenile audience. Davenier, Christine, and Graham, Bob, Senator, and Jeram, Anita, and Kleven, Elisa. Good. 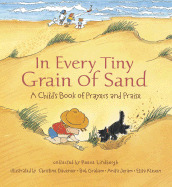 In Every Tiny Grain of Sand: A Child's Book of Prayers and Praise. Sewn binding. Cloth over boards. With dust jacket. 77 p. Contains: Illustrations. Intended for a juvenile audience.